These adorable little ghost pins are sure to put a smile on any little goblin's face this Halloween. These pins are so simple to make with only a few steps. First you will need the following supplies. Start by taking your cotton ball and rolling it tightly in your hand to make a tight ball. Place your cotton in the center of the diamond, fold the material over it and twist below the cotton ball. 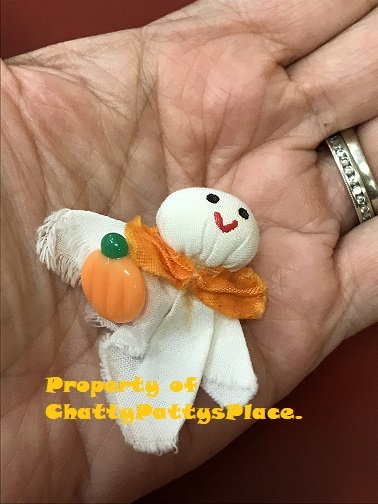 Take a piece of string and tie it tightly to form the ghost head. Feel free to trim the material to shape your ghost anyway you'd like. 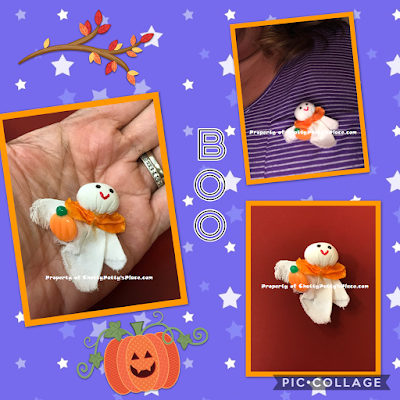 Very fun craft for Halloween. Thanks. These are a really cute craft to make with kids. I love the ghost! You're so creative! I wish I could have done this when my kids were younger. These would be great to hand out a classroom parties. That's super cute and festive for Halloween! This really is easy, and so cute! It would be fun to make a bunch to give away and one to keep for me!